A superbly designed WordPress theme for financial consultants and small businesses. Accentuate is an ultra-fast loading, business consulting WordPress theme designed to give you the best platform for modern consulting and professional services business websites. 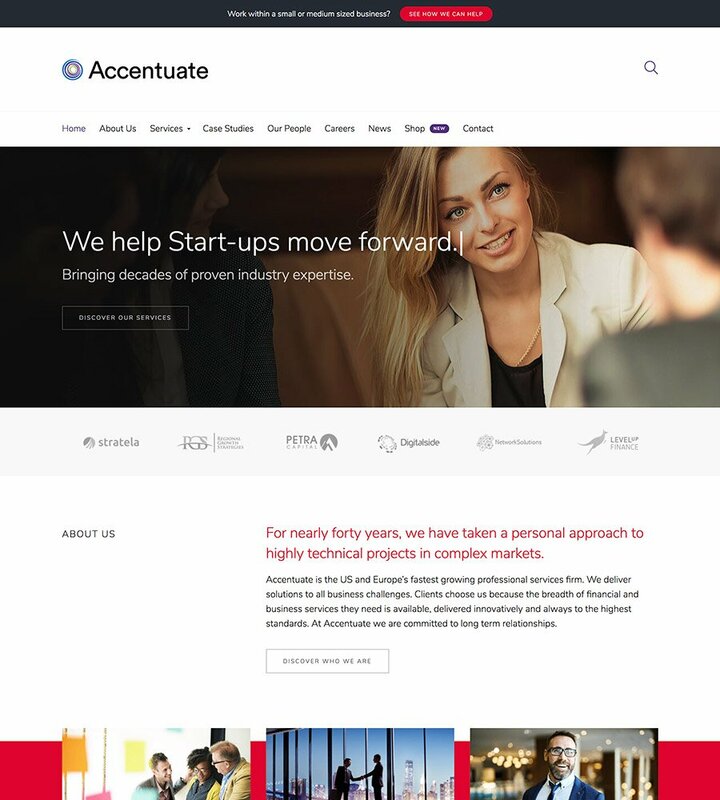 Whether you’re an up and coming, rapidly growing consultancy with aspirations of joining the Fortune 500 or a small niche business professional, Accentuate is the perfect WordPress theme to drive your business growth. Personalize fonts, colors, and layouts to create the look you want all within the customizer. With the included site builder, Visual Composer, and utilizing the full power of the WordPress customizer, see your changes happen instantly. There is no programming knowledge required – create stunning and beautiful pages. Within minutes, thanks to the included demo data, you’ll have a beautiful corporate website. With real example content pages focused on the business and finance niche – all you have to do is tweak the images and text. Our pre-defined content templates mean you can build a fully completed website in just minutes! No more starting with a blank slate spending hours trying to figure out how to create content. With Accentuate you will have a beautifully formatted content on phones, tablets, and desktops. Your visitors can expect great looking content whether they’re at the office or on the go. Add a Retina-ready logo so your brand stays sharp, no matter the resolution. The news page is beautifully laid out. Your company’s latest updates will, therefore, look fantastic within a clean grid design. We’ve carefully considered every design element to make your company website stand out from the crowd. After using Wordpress for just over 4 years, this is by far one of my favorite themes to work with! It's so easy to use and fast that I managed to relaunch a client's website in less than a week with amazing results. Thank you CommerceGurus!